Here on Lives & Legacies we’ve shown you a variety of important tasks that take place inside the Archaeology Lab at George Washington’s Ferry Farm. You’ve seen how we wash, catalog, label, and then mend vessels with archival glue. One goal of all this work is to piece together whole artifacts from the many broken bits found and share that whole artifact with our visitors as part of the exhibits in our museum gallery. Right now, a new exhibit of white salt-glazed stoneware vessels is on display at Ferry Farm. It took numerous staff and volunteers working hundreds of hours to get the vessels on display ready to be exhibited. Here’s how we did it! Seven reconstructed white salt-glazed (WSG) stoneware vessels make up a new exhibit at Ferry Farm. These pieces, which include two dinner plates, a fruit dish, three ointment pots (used for mixing medicines and cosmetics), and a tea ware or condiment pot lid, were all excavated from the Ferry Farm site. These ceramics were popular during the mid-18th century and most likely graced the tables of the Washington family. White salt glaze stoneware fruit dish, 1740-1765. 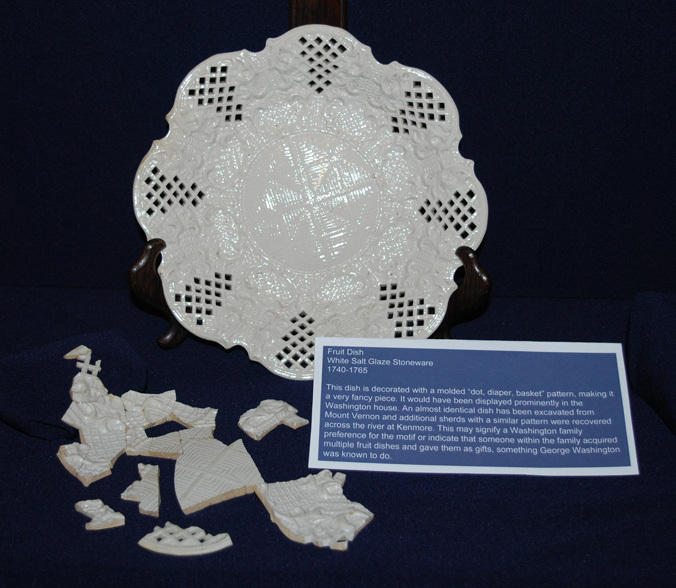 The dish is decorated with a molded “dot, diaper, basket” pattern and would have been displayed prominently in the Washington house at Ferry Farm. An almost identical dish has been excavated at Mount Vernon and additional sherds with a similar pattern were recovered across the river at Kenmore. This may signify a Washington family preference for the motif or indicate that someone within the family acquired multiple fruit dishes and gave them as gifts, something George Washington was known to do. In preparation for the exhibit, I spent the better part of three weeks in August and September finishing the documentation for the individual vessels and then meticulously gluing them together. This relatively small amount of time spent at the end of the project was only the tip of the iceberg – the total amount of time spent getting these pieces ready for exhibition encompassed a year and a half! Preparing these pieces to be displayed involved the hard work of numerous archaeology lab staff and volunteers. First, discussions were held within the archaeology department about studying Ferry Farm’s archaeological collection of white salt-glazed stoneware. Such a study would answer questions about the material setting of the Washington household and help with interpreting the forthcoming Washington house replica to the public. The project was given the go-ahead. Using our searchable artifact database, we generated a list of every piece of white salt-glazed stoneware in our collection. A total number of 1,623 artifact bags were on this list, representing over 2,800 actual sherds. 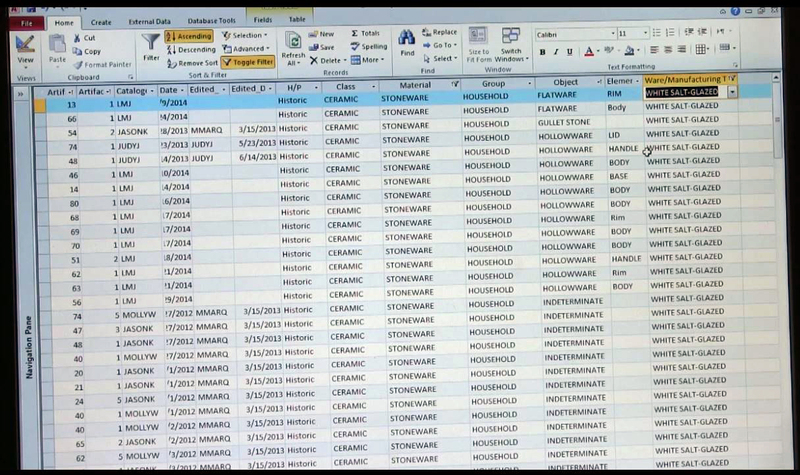 Screencap of the artifact database. We started pulling the 1,623 artifact bags from storage, and by my records, we were still pulling artifact bags in June. Lab staff, volunteers, and, on rainy days, the excavation field crews helped with pulling the artifacts. 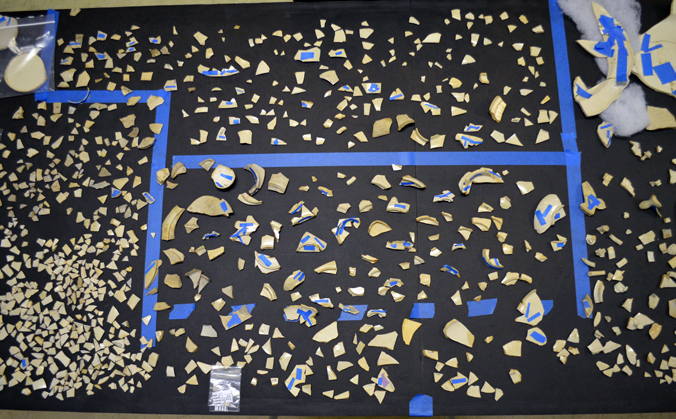 After making sure the sherds were labeled correctly, we laid them all out on one of the lab tables, which had been covered in a black foam board to make it easier to see the all-white ceramics. The sherds were first separated by decorative variations, such as plain white salt-glazed, slip-dipped, scratch blue, or dipped with iron oxide, and next by vessel part, such as rims, bases, and bodies. Then the cross-mending began. Sherds of white salt glaze stoneware waiting to be mended together. Over the next eleven months, countless hours were spent at the table looking for mends between the sherds. Having identifiable vessel parts, such as rims and molded and decorative elements, helped in the matching process, but there were hundreds of plain white, non-descript sherds to try and fit together. Pieces that mended were taped together with painter’s tape, which doesn’t leave an adhesive residue on the artifacts. A friendly competition began and whoever had the most mends at the end of each month won a free lunch! In all, everyone spent countless, addictive hours each week scrutinizing the sherds and patiently putting together “puzzles” for which, unfortunately, the majority of the pieces were missing. After eleven months, we cried “uncle” to the cross-mending and started the minimum vessel count by figuring out how many and what types of individual WSG vessels were represented in our collection. 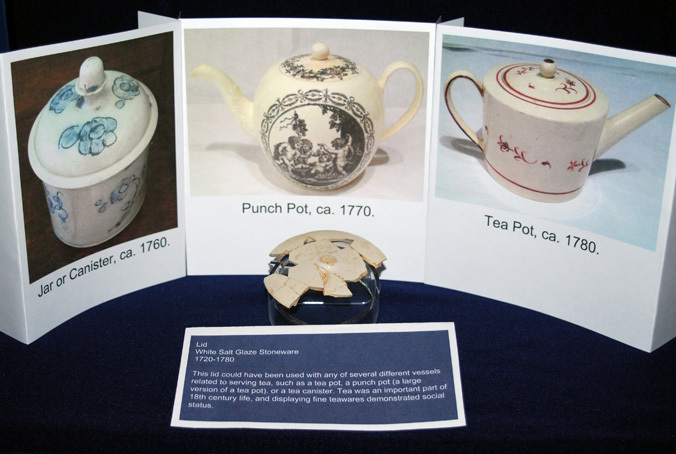 Under the supervision of Mara Kaktins, The George Washington Foundation’s ceramic and glass specialist, the sherds were separated into what we believed were individual vessels using the bases and rim styles. By late April, our choices were firm and over sixty white salt-glazed vessels were identified. July 2016: Putting the paperwork in order…. Treatment reports were started on the most complete vessels, which would be included in the new exhibit. 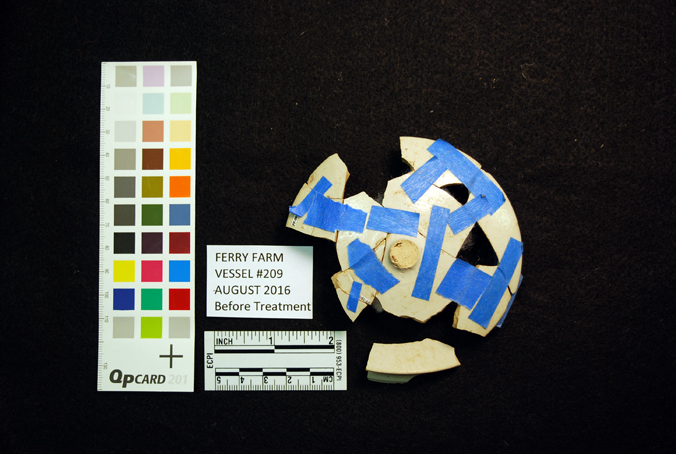 Each report listed all the sherds that made up each vessel and their condition. Photographs were taken to help with the mending and gluing. The remaining white salt-glazed sherds on the table were separated into bags according to decorative and body type, their contexts recorded in a spreadsheet for our records, and then returned in storage. August 2016: Finally, the fun part – gluing! I started gluing the vessels using a product called B-72, an archival glue that can be removed, if necessary, and that we mix ourselves in the lab. The design of the upcoming exhibit, including the layout, mounts and signage, was created by Meghan Budinger and Heather Baldus, the Foundation’s curatorial team. White salt glaze stoneware lid, 1720-1780. This lid could have been used with any of several different vessels related to serving tea, such as a tea pot, a punch put (a large version of a tea pot), or a tea canister. Tea was an important part of 18th century life, and displaying fine teawares demonstrated social status. The white salt-glazed stoneware exhibit is now installed and ready for the enjoyment of our visitors to Ferry Farm. A total of 614 days from report prep to exhibition! Archaeologists are somewhat unique in their appreciation for all things broken, mostly due to the coveted information discarded items can tell us about those who died long ago. However, occasionally a fragment is unearthed which is both informative and beautiful. Such is the case with a lovely cobalt blue decanter stopper excavated on the grounds of Historic Kenmore. Made from leaded glass to increase clarity, it seems quite heavy when placed in the hand. Six carefully hand-cut flutes adorn each side and when held up to a light it exhibits violet-colored highlights that accent the piece perfectly. Just the stopper alone is beautiful. Imagine how striking the entire decanter would have looked! Conveniently enough, that’s my job! During the late 18th century, the decanter and its stopper graced one of the rooms at Kenmore and held either fortified wine like Madeira, Port, and Sherry or a stiffer spirit such as rum or gin. It may have been part of a set and adorned with gold gilding that spelled out which heady beverage was contained within. I picture the decanter being picked up by one of the Lewis family’s enslaved servants on a dark night and a glint of purple from deep within the cobalt bottle shining as it reflects off of a candle while dark burgundy Madeira is poured forth into a waiting cup. All musings aside, however, the reality is that this stopper (which I am clearly obsessed with) also teaches us about how Fielding Lewis and his family lived. The decanter was a showy piece meant for display. It could be argued that, while it was a functional vessel, its primary purpose was to emphasize the wealth of the family and to impress guests. For us today, the stopper has a practical use. Meghan Budinger, Kenmore’s curator, was able to locate a similar vessel using the excavated stopper as a guide. While the decanter on display in Kenmore’s dining room is clear instead of cobalt blue, its shape and design closely match the cobalt decanter and stopper owned by the Lewises. Meghan continues her search for a blue decanter. Still, visitors and obsessed archaeologists alike may marvel at its beauty. In fact, most of the ceramics and glass in that room have archaeological equivalents that have informed Meghan’s choices. Thus, when asked by visitors why we have selected the beautiful tablewares before them, we can confidently answer that it is not just because they are pretty (so very, very pretty!) but also because, thanks to the archaeological record, we know the Lewis family owned pieces like them! You can see the clear glass decanter that is based on the cobalt blue stopper while also learning more about their ceramic cousins and about how archaeology has informed the choices of objects displayed inside Kenmore on a new specialty tour of the house called “Posh Pots and Decadent Dishes: The Lewis Family Life through their Ceramics.” Learn more about this new tour here. If antique glass is more your style, you can read more about Kenmore’s “Beautiful Glass” on The Rooms at Kenmore blog here.